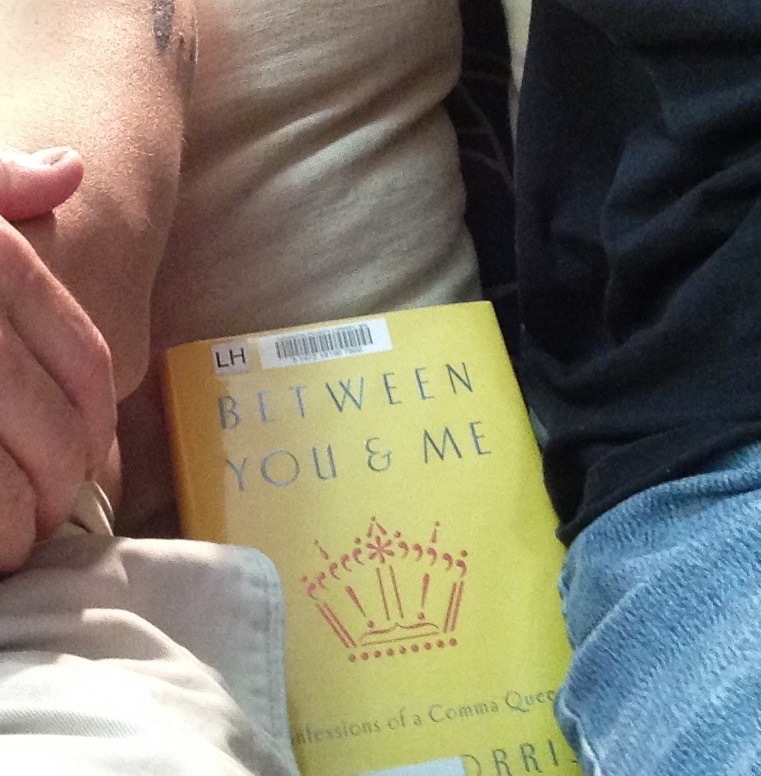 I believe it was Joan who prompted me to get myself in the library hold queue for Between You and Me by Mary Norris and I am glad I did! Norris has spent over thirty years as a copy editor for The New Yorker. She has stories! She also knows her grammar. Although she frequently recognizes that New Yorker style and the grammar everyone else uses don’t always align. And yes, she reports people being afraid her at parties, worried they are going to say something incorrect and that she will judge them. Norris insists she has no time or inclination for that malarky yet however reassuring she tries to be, there are some who can’t believe she isn’t silently ripping them to shreds. A pity too because if she is anything in person like she is in her book, she has a great sense of humor. Though as a grammar geek she does have issues as anyone who is geeky about something will. Like the time she read Light Years by James Salter. She had been hearing about how good he is for a long time and finally decided to read one of his books. She loved it but was pulled up by one sentence, particularly a comma in that one sentence, that seemed to her unnecessary. It bugged her so much she wrote him a letter asking about it. Salter kindly wrote back to her and explained why he used a comma where he did and Norris was completely satisfied with his answer. How many of us would write an author about a comma? The book is part memoir, part grammar lesson, and sprinkled with the occasional hint of annoyance over all the mistakes people make on a daily basis. There is an entire chapter on “you and I” versus “you and me” and why most of the time “you and me” is the correct usage. Another chapter discusses the problem of there being no gender non-specific pronoun in English that accounts for he and she, him and her, forcing people into terrible grammar contortions and even prompting many to suggest such near atrocities as “ne, nis, nim” or “shi, shis, shim” or “mef” or “hu.” She acknowledges most people have thrown in the towel and settled for “they” and “their” and while she can manage to not be too upset by “they,” “their” is completely unacceptable in her book. Other things we learn are the correct usage of “which” and “that.” While I was reading it I felt I would never forget the rules but if you ask me right now I will mumble something about restrictive and nonrestrictive clauses and oh, I’m sorry, I have to go take this phone call. I know I get these mixed up all the time but it is hard to make myself care. Should I? One of my favorite chapters is on dashes, semicolons, and colons. I love dashes and once, long ago, after reading all of Emily Dickinson’s poems over the course of a month, I became a dash maniac. I have since tempered my usage but —oh! — I love them so. I used to be terrified of semicolons and would do my best to avoid any sentence that might need one. But a few years ago I read something, I can’t remember what, that gave me the confidence to start using them. And once I began I decided I really like semicolons even if I am never actually certain whether I am using them correctly. In her chapter Norris does a marvelous analysis on how Henry James uses semicolons. You will not be surprised to know he is absolutely brilliant at it. I am shy about colons and will probably always remain so. I had a writing teacher once drill into my head that a colon was like a big neon sign and that if I ever used one, what came after it had better be good. I guess you could say my shyness of colons stems from a fear that I could never say anything good enough to justify a neon sign. Norris is more reassuring on the matter but I believe I have been scarred for life. At times I felt like Norris comes across a teeny bit condescending and know-it-all. Perhaps given her position at the New Yorker she really does know it all, but no one likes that especially when it comes to grammar. She has a light, breezy style and is witty and funny, but sometimes her jokes fell flat with me, particularly in her chapter about profanity. However, Between You and Me is overall a fun and enjoyable book that includes some of the most pleasant grammar lessons I have ever had. I highly recommend it should you ever need something to fill an empty spot in your TBR pile. Would it be any good as a reference book? I’ve wondered that, since I have a small budget to add to the books in the Writing Center. Jeanne, no, not a good reference book, though you could use pieces of it for such, overall it is too much of a story narrative to be useful as reference. This sounds wonderful. I want to read it, but I think I’ll buy it for my lexicographer Mum for Christmas and then I can read it. (I think I’ve bought books for her before that you’ve recommended). On the comma issue, I remember when my daughter was in last year of primary school, the Principal organised a grant for a writing project. My daughter’s story was one of those to be included. The Principal was the editor and wanted to remove a comma. My daughter insisted she wanted the comma, but the comma went. A few months later the principal told me that she now thought my daughter was right! I think that was nice of her to say so. It was really a fine distinction that my daughter wanted to make. whisperinggums, it was enjoyable. Your lexicographer mum will like it very much! And so will you when you borrow it 😉 Good for your daughter about being so sure on that comma, but too bad it got removed anyway. That was nice of the Principal to admit she was wrong about it later. I think she will – I’ve now ordered it. I’m always glad when I can order a Christmas gift so early! Sounds like fun. My favourite grammar book to date has got to be ‘Eats, Shoots and Leaves’, but I’m always on the look out for stylish writing about writing. shoshi, in spite of “Eats, Shoots and Leaves” being so popular I never managed to read it. Maybe I will get around to it over the winter. I suspect this one is not quite so grammar-centric as the other, it has too much memoir and New Yorker gossip in it, but there are still some good discussions in it. I’m glad you liked it, Stefanie. I am a comma freak. I have thrown books across the room when the author (and editor) eschews commas. One little comma can clarify so much, and the lack of one can make a sentence totally incomprehensible to me. I shall have to get hold of a copy of this, if only to argue with her. Does she actually claim that commas and the like are grammar? If so, she and I are going to have a parting of the ways! In my humble opinion, no one knows everything about grammar because grammar describes how we organise language and that is changing all the time. My editing job mostly focuses on copy editing, so I’ve been dying to read this. I’m pretty sure I’d have plenty to argue with her about, but I’d love to hear her perspective, especially since the New Yorker has such a quirky style. Teresa, I thought about you while reading this and wondered what you would make of it. The New Yorker style is pretty quirky and Norris acknowledges that. She also talks about how hard it is to get changes to the style put through. They are a conservative bunch there it sounds like! If you read the book I’d be interested to hear your perspective on the various things she talks about. I can imagine life would be pretty tedious and unhappy if you spent your time judging everyone’s grammar! But it’s interesting how so many people are insecure about how they use language. I like how you say you’ve learned how fluid some rules are. I think that is obvious to people who read a lot. I mean, Jose Saramago all on his own keeps things interesting! I think I need to read this–always good to review points of grammar. I do and tr and look things up when I am not sure, but I probably have little quirks I assume are correct but are not. Somehow grammar books have a certain appeal to me, though I never seem to pick them up. My library even has this one….but someone has checked it out (must be faculty since it is not due until mid-December!). Well, something to add to my wishlist anyway. This book sounds so fun!